I vividly recall sitting in my kitchen, many years ago, when my entire body started to vibrate inside wildly. At the time, my 3 month old son was in intensive care at Health Centre for Children, and I didn’t stop to consider what the feeling meant. I just knew I had to get to him as quickly as possible. I remember very little of the 15 minute drive there. When I arrived, the medical team and nurses were in a corner away from my son, doing rounds. He was having a seizure and no one had noticed it. Once I made the connection between his seizure, his first, and my fairly strong body sensations, my body relaxed somewhat, and relaxed even more as the medical team came to his rescue. There were other incidents as well where my body sensations were so strong that I needed to act on the felt sense I had. On several occasions, I had changed my activities or direction due to a deep sense of difficulty or danger that one of my family members were experiencing. In each case, it was a stirring, vibratory, compelling, and indisputable feeling that had its roots in a felt sense in my body. In each occasion the messages were accurate. As I reflect back on these moments, I was willing to pay attention and respond when the message was dramatic and significant, but the concept that I could tap into my body for guidance or information on a more regular basis was not part of my practice or consciousness. Subsequently, energy healing training and my training in Focusing introduced me to the concept of tracking mentally what I was sensing physically. This deepened further when I started my Satir Level 1 training. The practice of monitoring Channels 1, 2 and 3, during therapy demonstrations or videos brought the importance and the skills together of paying attention to several levels simultaneously, including my body, in a renewed and more compelling way. Virginia Satir’s attention to and references to the body are numerous, and multifaceted. She speaks of touch as a way to connect with her clients, and even to acquire important genealogical information about them as she held their hands. 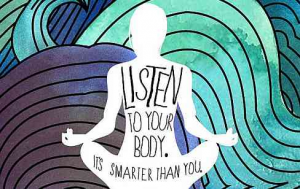 The body was central to communication in every way for her: from observing body messages, communicating support for her client, and/or helping a client to shift awareness. References to the body are a legion throughout her teachings. Each of us has one of our five senses that tend to be dominant over the others as a means of gathering information and for taking care of ourselves. As I began to practice tracking my inner self and clients in a deeper and more systematic way, I began to marvel at how much information and direction I received by doing this tracking. For me it was a vibratory sensation or resonance that directed and shifted my attention, often with significant results. I was attending a workshop involving the use of sound in healing. I had asked my teacher if I might join her for one of her Asian trips, which were open to her students. She mentioned several possibilities, but the moment she mentioned her Myanmar trip, my entire body started to vibrate with excitement. She encouraged me to think it over and get back to her, but my strong body sense was that there was no need to think this one through; the body had spoken loudly, and would be the final decision maker; and what a wonderful trip it was!!! In my early years of life every major decision, and some minor ones, were carefully considered in great detail mentally, with lists of pros and cons, and were often redeliberated over for days. I spent more of my daily energy on future events, often, than what was happening to me hour by hour. Thus, this change in honouring my body as wisdom source and guide has been a very significant shift for me. One incident in my private practice, where that sense of resonance in my body played a pivotal role, happened a couple of years ago. My client has given my permission to share this, as it was a very powerful moment for each of us. I was sitting with a gentleman who was seeking support after the death of his wife. He was talking in quite an animated way when I observed, in the window behind the couch where he was sitting, a hummingbird trying to get in through the window. The window is on the second floor of a commercial building, and there were no flowers or bird feeders anywhere around, yet the bird kept moving back and forth to the window as if looking for an entrance for quite a few minutes. I had a strong felt sense that the bird was an important messenger, as my body did its ‘vibrating thing’, as if to say, “pay attention here! !” I hesitated to interrupt my client and I let him continue, until an opening naturally occurred. I did a quick body consult about sharing this with him, and received a resounding “yes”. His reply was he believed that this was the spirit of his wife coming to comfort him. He stated a hummingbird had visited him daily for quite a while after her death and he felt comfort each time this had happened. He said the ‘visitations’ were less frequent of late, but still happened during especially emotional times for him. He also stated he had felt reluctant to share that with me before, as he thought I might think he was somewhat “unbalanced” in imagining his wife’s spirit might be connected with a bird in this way. He was greatly relieved to be able to share it, and I marveled at the way that had played out, first in my body, and our therapy sessions ultimately. Virginia treated our body, mind and spirit as one whole and rarely spoke of them as separate. She also stressed the importance of being grounded and centered when working with clients, and in all aspects of our daily living. I am often aware that the times when I am most likely to receive significant body sensed messages are when I am more centered and grounded, a precondition to being open to messages that I might regard as spirit-driven or inspired. Despite that, listening to and honouring my body as wisdom source continues to be a work in progress. It still has a slight ring of being counter to conventional wisdom; however, each time that thought comes to mind, I check myself, and I offer deep gratitude to Virginia, who continuously broke through and beyond the conventional wisdom of her day, to give us the wonderful model we have today, for not only our work, but all of our daily living and growing.